April 5, 2013.- During the first quarter of 2013, the electricity demand in the main countries of Western Europe has been defined by the evolution of the economic activity and the weather conditions of each country. In countries such as Spain and Italy, which have been severely affected by the current economic crisis and where the temperatures registered in the first three months of this year have been higher or similar to those registered in the same months of last year, the demand has experienced a considerable decrease. In other countries, such as France and Great Britain, whose economies are more stable and where the temperatures recorded in the last quarter have been lower or similar to those recorded in the first quarter of last year, the electricity demand has increased. 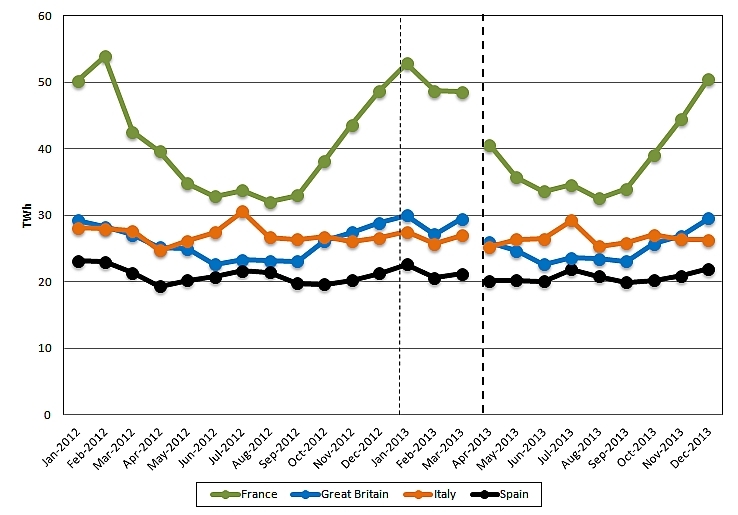 Monthly evolution of the electricity demand in Western Europe – 2012 and the first quarter of 2013 – in TWh. 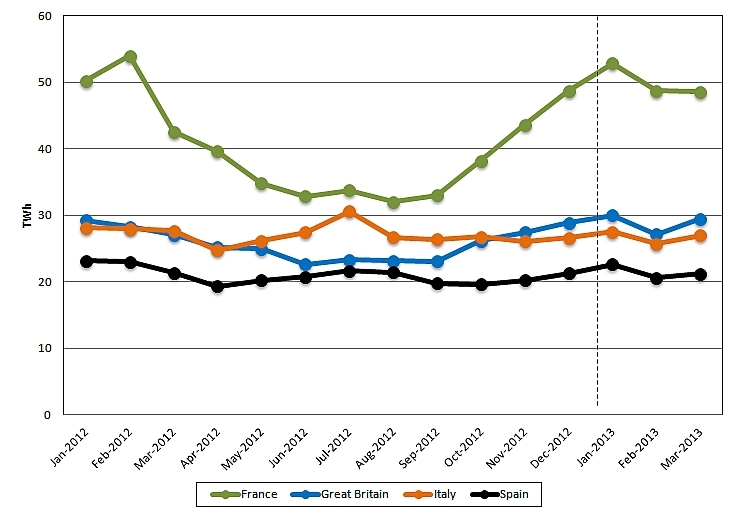 Data sources: France – RTE, Great Britain (GB) – National Grid, Italy – TERNA, Spain – REE. In Spain, the electricity demand in the first quarter of 2013 has decreased by 3.6% with respect to the same quarter of last year. When compared to March of the past year, this March experienced a decrease of 0.8%. When corrected by working days and temperature-related effects the drop has been of 2.2%. In France’s case, the electricity demand has increased by 3.5% on a year-on-year basis in this last quarter. In March of 2013, the demand in France was 14.3% higher than in March of 2012. Another country that has experienced a growth in the electricity demand in the first quarter of 2013 is Great Britain, with an increase of 3.6% when compared to the same quarter of the past year. In March, the demand grew by 8.8% on a year-on-year basis. On the other hand, the electricity demand in Italy has shrunken by 3.1% in the first quarter of this year when compared to the same quarter of last year. In March, it decreased by 2.3% with respect to March of last year. 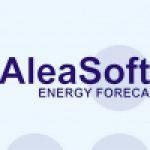 AleaSoft forecasts that the electricity demand in Spain in this current quarter will grow by 0.3% when compared to the same quarter of last year. In the second half of this year, a growth in the demand of 1.4% is expected on a year-on-year basis. By the end of 2013, the demand will have dropped by 0.2% regarding the demand registered in 2012. The used GDP scenario forecasts a 1.5% drop for this year 2013. In France, it is estimated that the demand would continue to follow a growing trend and that the demand for the second quarter of 2013 would grow by 2.4% on a year-on-year basis. The electricity demand in the second half of this year is expected to increase by 2.6% with respect to the same half of the past year. The electricity demand in 2013 is expected to register a 2.8 % growth with respect to 2012. The GDP used for this forecast suggests that the French economy will experience an increase of 0.3% in the year 2013. In Great Britain, the demand for this quarter is expected to grow by 0.6% with respect to the second quarter of the past year. In the second half of this year, an increase of 0.3% has been forecasted on a year-on-year basis. 2013 is expected to close with a growth in the electricity demand of 1.2%. These forecasts have been made using a GDP growth of 0.6% for the year 2013. For Italy, AleaSoft forecasts that the electricity demand in the second quarter will have decreased by 0.3% when compared to the same quarter of last year. The electricity demand in the second half of this year is expected to shrink by 1.9% on a year-on-year basis. The forecast for 2013 is that the electricity demand will drop by 1.8% with respect to 2012. The GDP used for this forecast augurs that the Italian demand will suffer a 1.0% decrease in the year 2013.